As bad as it gets yesterday with no swell and an onshore wind, while today some new mid-period swells is filling in with light winds favouring the beaches, 2ft on the Surf Coast and 3ft on the Mornington Peninsula. Sets should reach 2ft to occasionally 3ft on the Surf Coast and 3-4ft+ to the east this afternoon but with SE sea breezes. Today the surf has bottomed out with tiny clean waves across all locations. This afternoon's peak in mid-period W/SW and SW swell will ease into the end of the week but conditions will be great for exposed beaches across the state. A N/NE offshore is due tomorrow morning, likely lasting most of the afternoon with easing 3ft+ sets on the exposed beaches east of Melbourne, a small and infrequent 2ft on the Surf Coast swell magnets (tiny into the afternoon). Friday will be clean again with local offshore winds, but the Surf Coast will be tiny, and the Mornington Peninsula 1ft to maybe 2ft if we're lucky, but I wouldn't count on it. Our small increase in long-period SW groundswell for Saturday is still on track, though don't expect any size on the Surf Coast, with a small lift in size for the Mornington Peninsula. This is being generated by a strong polar low today, generating a fetch of gale to severe-gale W/NW winds on the shelf, not ideally aimed towards us. The Surf Coast magnets should see inconsistent 2ft sets Saturday, with 3ft+ waves to the east (again inconsistent) and a N'ly breeze will create clean conditions most of it not all day. The swell will fade into Sunday leaving tiny waves on the Surf Coast and a surface trough moving in from the west will bring early W/NW tending SW winds. Into next week, a small and inconsistent W/SW groundswell is due to build Monday and ease into Tuesday, produced by a strong but distant storm firing up west-southwest of WA today and tomorrow. An initial fetch of gale-force W/SW winds will be projected through our far western swell window, weakening while pushing towards the south of WA and into the Bight. A fun but inconsistent and acute W/SW groundswell should be seen, building through Monday and reaching 2-3ft at Surf Coast magnets, 4-5ft to the east. Winds after Sunday's change look to linger from the SW though without too much strength, cleaner Tuesday as the swell eases under a morning N'ly. 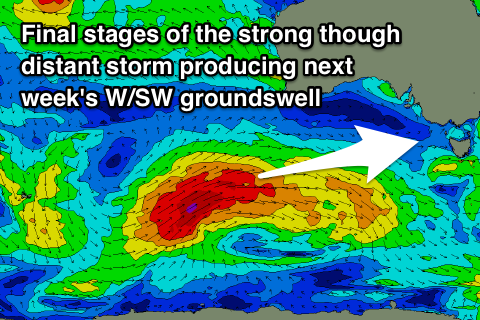 Of greater importance is a larger and long-period though inconsistent W/SW groundswell due later in the week. This will be generated by another very distant but strong storm, with a low forecast to develop north of the Heard Island region this weekend, moving slowly east while generating a fetch of severe-gale to storm-force W'ly winds. The storm is expected to weaken south of WA early next week, with the strong though inconsistent groundswell arriving late Wednesday and peaking through Thursday. At this stage the Surf Coast looks to come in at a strong 3-5ft, with 6ft+ sets to the east though with winds from the east to north-eastern quadrant. This is a long way down the track though so we'll review it and a possible bigger follow up swell next weekend on Friday.